There are penthouses with views and then there’s the High Command. 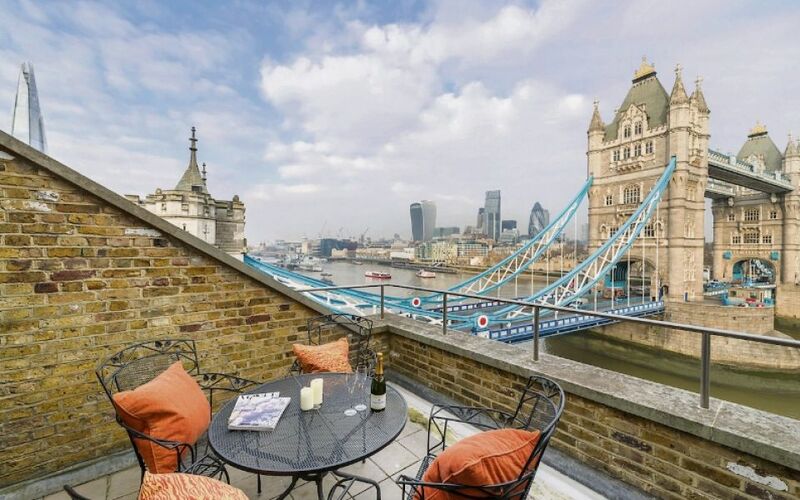 This highly unusual Grade II Listed property in Shad Thames is so close to Tower Bridge that it’s practically within touching distance when you’re having a cup of tea on one of its many terraces. In fact, the entire four storey property has been set up to frame the view. A huge open plan dining room and lounge greets visitors on arrival and there are no fewer than five terraces from which to enjoy an eyeful of the most famous bridge on the globe. This is the first time this penthouse has been on the market in 35 years as it’s been home to the property developer who converted the historic warehouse it sits atop into apartments. After finishing the scheme, he kept the jewel in the crown for himself. Formerly the old Courage Brewery site located directly next door to Tower Bridge on the South Bank, it is now Anchor Brewhouse and this home sits between the seventh and tenth floors. A 24-hour porterage, complete with slick dark tiles and tinkling water features, greets residents on arrival. The lucky owner also gets non-view-related perks, such as four secure allocated parking spaces and an internal private lift between floors. There’s over 4,280sqft of space including an eighth floor master bedroom suite, with an ensuite and a walk-in dressing room, plus a rotunda on the top floors that makes for a stunning sanctuary, whether you use it as a library (as it is currently), art gallery or wine cellar. It’s been on the market with estate agent Cluttons for the last 18 months and the price has been reduced from £12.5m. As it hasn’t had an update in over three decades, Cluttons has hired local architect Tim Flynn to draw up some ideas for how the space could be opened up, scattering sketches throughout the property for prospective buyers. James Hyman, head of residential at Cluttons, says he sees the penthouse going to a wealthy UK-based buyer who has the time to spread some tender-loving care. “These are a rarity on the market because a lot of people see properties like these as a long term asset and hold on to them,” says Hyman. At £1,800psqft, he says it’s also around £800psqft better value than comparable new penthouses in the area.